Dave Elger on Running, Racing and Training: Get Ready to Rumble- Roll! Get Ready to Rumble- Roll! I'm ordering a Rumble Roller today! 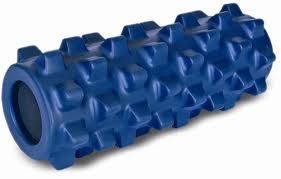 If you are not familiar with foam roller therapy, this looks like it's going to be painful at first, so I recommend some initial work with a conventional roller. Another option is the hollow Grid , that is more expensive than the regular foam but is more portable and should be more durable.